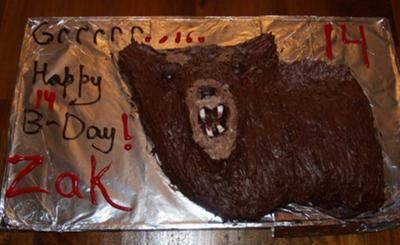 This bear cake was made for my son's birthday. We wanted to commemorate the occasion of a bear breaking into Zak's grandparents' cabin on a remote island in upper Michigan. I used a combination of one rectangular cake (9x13 pan) and 2 round cakes (8 inch pan). I made two shades of brown frosting by using food coloring. There was a lot of cutting and frosting to get the shape. The raised snout added a 3-D effect. To get this, I cut a small oblong piece and placed on the face. The fur (strokes with a vegetable cleaning brush) added to the texture. I cut a hole in the snout for the mouth and used marshmallows (sliced thinly) for the teeth. Red food coloring gave the perfect bloody look! The eyes are Tootsie pop suckers (chocolate flavor) with the sticks cut off. We had a lot of fun with this one. Hope you like it! We had a bear break into our camp and steal food a few years ago. We also had 2 in our yard. I love the marshmallow idea too. Wow! It looks so real that we were scared!